World record holder Joey “Jaws” Chestnut devoured 69 hot dogs in ten minutes at the famous Nathan’s Hot Dog Eating Contest in Coney Island. Although he sets the precedent, there are many who follow in his footsteps hoping for glory, including our very own intern, Haley “Ketchup if You Can” Armstrong. With such global captivation, you better believe the competitive eating craze hasn’t escaped the AEC industry. 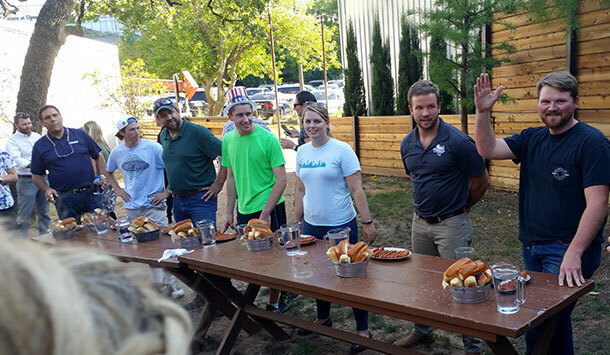 That’s why, last week, Dallas’ Brightview Landscape Development hosted its annual intern/rookie hot dog eating competition at the Rustic off Howell Street. With the same spirit of excitement and moderate gluttony that accompanies all eating contests, Haley entered the event to represent RVi. Elbow to elbow with six competitors, Haley started out strong running neck and neck with the eventual winner at a pace of one hot dog a minute for three minutes. She finished out the contest with a total of six hot dogs in the allotted ten minutes, displaying incredible sportsmanship and technique. While she narrowly missed the big prize money, she did come away with an RVi fanbase and a place among the esteemed competitors of food-stuffing. Way to go, Haley! You made us DOGGONE proud! Haley was awesome! We are glad you were able to participate and look forward to next year.